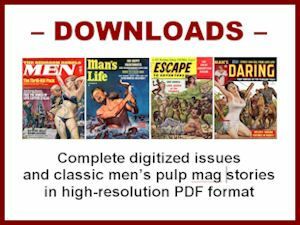 Robert F. Dorr, the great military aviation historian, journalist and novelist who got his start as an author by writing stories for men’s adventure magazines in the 1960s and 1970s, passed away on Sunday, June 12, 2016 at age 76. Regular readers of this blog know that Bob Dorr is one of my favorite writers. I have done many posts here about his stories and books. Most of Bob’s many fans know him best for the scores of books he wrote about military aircraft and the men who flew them, or for his regular columns and commentaries in military magazines and newspapers, or for the many articles he wrote for aviation and history magazines. But before all that, he learned his craft as a writer working for men’s adventure magazines. He wrote hundreds of stories for them in the ‘60s and ‘70s. Many are among the best ever written for the MAM genre. My publishing partner Wyatt Doyle and I included two of them in the first book in our Men’s Adventure Library series. That first book is a kind of “all star” collection of MAM stories by writers like Lawrence Block, Harlan Ellison, Bruce J. Friedman and Robert Silverberg. That’s the league Bob Dorr was in as a writer of short stories (for any genre). 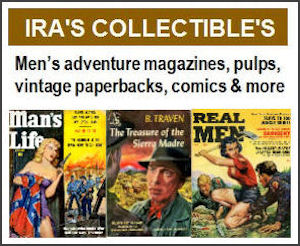 More recently, we worked with Bob to publish a collection entirely composed of war and adventure stories he wrote for men’s adventure magazine stories, titled A HANDFUL OF HELL. 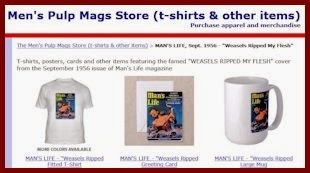 I have talked to Bob off and on by phone and email since 2009, after he noticed this blog and contacted me to let me know he had written many stories for men’s adventure mags. He became a long-distance friend and eventually a collaborator and a mentor on indie publishing. Bob’s passing hit me hard, even though I knew it was coming. He told me in a phone call last November, around the same time he announced it in a post on his personal blog on November 17, 2015. It appears to be a Glioblastoma, the most common but also the most aggressive kind. I'm in good spirits amidst these gorgeous autumn days with wonderful support from family, friends, and readers. Well, okay, not every reader. One reader mailed me a package of Preparation H. That's genuinely thoughtful but maybe not the work of an adoring fan. My first paid publication was in the November 1955 issue of Air Force magazine when I was in high school. I got to be in the Air Force in Korea and to spend 60 years writing about those who fly and fight. A current example is the cover story on the B-24 Liberator in the January 2016 AVIATION HISTORY magazine...Thanks to my family, friends, and readers for a great time. In the months after that shocking announcement, the effects of the brain tumor increasingly robbed Bob of his ability to hit the right keys on a computer keyboard. Nonetheless, in the first few months after his diagnosis, he managed to complete and self-publish his second novel CRIME SCENE: FAIRFAX COUNTY. It was a follow-up to his alternate history novel, HITLER’S TIME MACHINE, his first foray into the realm of novels, though not his first in the realm of fiction. That was a craft he learned and honed long ago writing for men‘s adventure magazines. Bob put fiction writing behind him for decades. Then, about two years ago, he became increasingly disillusioned with writing books for mainstream publishers whose fortunes and marketing efforts were waning and decided that writing and self-publishing novels might be a fun alternative. After his cancer diagnosis, Bob also wrote a series of blog posts about his life, his recent books and people who influenced and inspired him. The titles of many of those posts include the number of days since Bob’s brain tumor had been discovered. That struck me as both an acknowledgment of the fact that many people diagnosed with a Glioblastoma tumor die within a few months — and his determination to exceed that timeline and continue to work as a writer as long as he could. Some of the “influencers” he wrote about in his final blog posts were old friends he knew in the Air Force or during the few years he spent in California in the early 1960s, in between his military service and his 25-year career as a globe-hopping Senior Foreign Service Officer with the U.S. State Department. 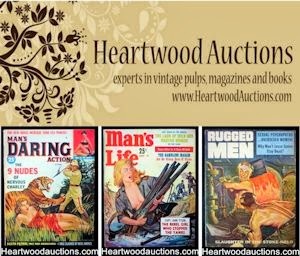 Among other things, Bob found it humorous that he had used names and photos of several of his old friends for characters in men’s adventure magazine stories he wrote. He first told me about that funny aspect of some of his MAM stories when we were working with him on his introduction to A HANDFUL OF HELL. Another “influencer” he wrote about on his blog was Robert Des Lauriers. Des Lauriers was among the hundreds of Air Force servicemen Bob Dorr interviewed for his magazine articles and history books. He was co-pilot of one of the B-17 Flying Fortress heavy bombers featured in Bob’s World War II history book MISSION TO BERLIN. That and other military aviation history books Bob Dorr wrote, like MISSION TO TOKYO and HELL HAWKS! (co-authored with former astronaut Thomas D. Jones) have aptly been described as being like BAND OF BROTHERS in the sky. In them, Bob illuminates history and gives it an up-close-and-personal feel by focusing heavily on the first-hand accounts, letters and journals of individual American pilots and crew members. 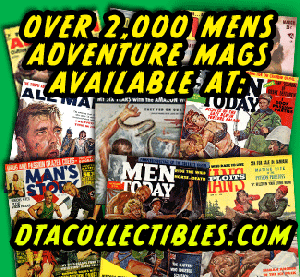 The war stories Bob wrote for men’s adventure magazines were forerunners of that personalized approach. Some were about real people, many were fictional. But almost all were gripping, highly-humanized stories about rank-and-file guys who fought and died in the air and on the front lines in World War II, the Korean War and the War in Vietnam. Bob also tipped his hat to many other interesting people in the blog posts he wrote after his cancer diagnosis. Three of them are members of the Men’s Adventure Magazines Facebook Group that Bob Dorr co-founded with me over five years ago: novelists Paul Bishop, Chuck Dixon and James Reasoner. Bob admired them both as talented professional writers and as pioneers in the realm of self-publishing, a course he pursued for his two novels and his last non-fiction book AIR POWER ABANDONED. That one is a scathing, eye-opening exposé about what Bob called “the dismantling of the U. S. Air Force” that began after the first Gulf War in 1991 and became progressively worse during the tenure of Robert Gates as U.S. Secretary of Defense. In his next to last blog post, Bob mentioned some amazing facts about himself. They provide a hint of how much he loved flying and writing and how active and prolific he was. It discussed what was, in fact, the last magazine article he was able to write: a history piece about Avenger torpedo bombers, published in the June 2016 issue of AMERICA IN WWII magazine. That heartfelt line reflects a major thread that runs through of most of Robert F. Dorr’s written works, from his first published men’s adventure magazine war story in the April 1962 issue of REAL to his last piece for AMERICA IN WWII. For me, it was a great privilege to have had the opportunity to get to know Bob and to reprint his men’s adventure magazine stories. During the time I knew him, he became one of my own personal heroes — as a writer, as a keeper and teller of part of America’s cultural history and as a human being. A number of websites did retrospective posts about Bob Dorr shortly before or after he passed. Several said things that help shed light on Bob’s legacy, his worldview and his lifelong empathy for the airmen and soldiers who serve in the military. Airmen brought him their gripes and concerns — they knew he would listen to them. Dorr was also a vocal opponent of the military’s Don’t Ask, Don’t Tell policy for homosexual service members. Another is the obituary written by Bob’s friend Chuck Oldham, editor of the DEFENSE MEDIA NETWORK website and publishing company.